Armed resistance to tax collectors was eliminated, but tax evasion remained. The Whiskey Rebellion, or Whiskey Insurrection, was a tax protest in the United States beginning in 1791, during the presidency of George Washington. Farmers who used their leftover grain and corn in the form of whiskey as a medium of exchange were forced to pay a new tax. The tax was a part of treasury secretary Alexander Hamilton's program to increase central government power, in particular to fund his policy of assuming the war debt of those states which had failed to pay. The farmers who resisted, many war veterans, contended that they were fighting for the principles of the American Revolution, in particular against taxation without local representation, while the Federal government maintained the taxes were the legal expression of the taxation powers of Congress. Throughout counties in Western Pennsylvania, protesters used violence and intimidation to prevent federal officials from collecting the tax. Resistance came to a climax in July 1794, when a U.S. marshal arrived in western Pennsylvania to serve writs to distillers who had not paid the excise. The alarm was raised, and more than 500 armed men attacked the fortified home of tax inspector General John Neville. 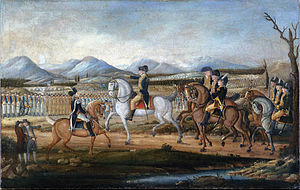 Washington responded by sending peace commissioners to western Pennsylvania to negotiate with the rebels, while at the same time calling on governors to send a militia force to enforce the tax. With 13,000 militia provided by the governors of Virginia, Maryland, New Jersey, and Pennsylvania, Washington rode at the head of an army to suppress the insurgency. The rebels all went home before the arrival of the army, and there was no confrontation. About 20 men were arrested, but all were later acquitted or pardoned. The Whiskey Rebellion demonstrated that the new national government had the willingness and ability to suppress violent resistance to its laws. The whiskey excise remained difficult to collect, however. The events contributed to the formation of political parties in the United States, a process already underway. The whiskey tax was repealed after Thomas Jefferson's Republican Party, which opposed Hamilton's Federalist Party, came to power in 1801. A new U.S. federal government began operating in 1789, following the ratification of the United States Constitution. The previous government under the Articles of Confederation had been unable to levy taxes; it had borrowed money to meet expenses, accumulating $54 million in debt. The states had amassed an additional $25 million in debt. Alexander Hamilton, the first Secretary of the Treasury, sought to use this debt to create a financial system that would promote American prosperity and national unity. In his Report on Public Credit, he urged Congress to consolidate the state and national debts into a single debt that would be funded by the federal government. Congress approved these measures in June and July 1790. A source of government revenue was needed to pay the respectable amount due of the previous bond holders to whom the debt was owed. By December 1790, Hamilton believed import duties, which were the government's primary source of revenue, had been raised as high as was feasible. He therefore promoted passage of an excise tax on domestically produced distilled spirits. This was to be the first tax levied by the national government on a domestic product. Although taxes were politically unpopular, Hamilton believed that the whiskey excise was a luxury tax that would be the least objectionable tax the government could levy. In this, he had the support of some social reformers, who hoped a "sin tax" would raise public awareness about the harmful effects of alcohol. The whiskey excise act, sometimes known as the "Whiskey Act", became law in March 1791. George Washington defined the revenue districts, appointed the revenue supervisors and inspectors, and set their pay in November 1791. The whiskey excise was immediately controversial, with many people on the frontier arguing the tax unfairly targeted westerners. Whiskey was a popular drink, and farmers often supplemented their incomes by operating small stills. Farmers living west of the Appalachian Mountains distilled their excess grain into whiskey, which was easier and more profitable to transport over the mountains than the more cumbersome grain. A whiskey tax would make western farmers less competitive with eastern grain producers. Additionally, cash was always in short supply on the frontier, so whiskey often served as a medium of exchange. For poorer people who were paid in whiskey, the excise was essentially an income tax that wealthier easterners did not pay. The main objection to the whiskey tax was that it was taxation without (local) representation, exactly what they'd just fought the Revolutionary War to stop. Many tax resisters were veterans. In the Western view, they were fighting for freedom, resisting the newly emerging central state. Furthermore, why should they pay other people's debts? Some states had repaid their war debt. The Federalists were buying support from indebted states with their policy of assumption. Small farmers also protested that Hamilton's excise effectively gave unfair tax breaks to large distillers, most of whom were based in the east. There were two methods of paying the whiskey excise: paying a flat fee or paying by the gallon. Large distillers produced whiskey in volume and could afford the flat fee. The more efficient they became, the less tax per gallon they would pay (as low as 6 cents according to Hamilton). Western farmers who owned small stills did not usually operate them year-round at full capacity, so they ended up paying a higher tax per gallon (9 cents), which made them less competitive. Small distillers believed Hamilton deliberately designed the tax to ruin them and promote big business, a view endorsed by some historians. However, historian Thomas Slaughter argued that a "conspiracy of this sort is difficult to document". Whether by design or not, large distillers recognized the advantage the excise gave them, and they supported the tax. In addition to the whiskey tax, westerners had a number of other grievances with the national government. Chief among these was the perception that the government was not adequately protecting the western frontier: the Northwest Indian War was going badly for the United States, with major losses in 1791. Furthermore, westerners were prohibited by Spain (which then owned Louisiana) from using the Mississippi River for commercial navigation. Until these issues were addressed, westerners felt the government was ignoring their security and economic welfare. Adding the whiskey excise to these existing grievances only increased tensions on the frontier. Many residents of the western frontier petitioned against passage of the whiskey excise. When that failed, some western Pennsylvanians organized extralegal conventions to advocate repeal of the law. Opposition to the tax was particularly prevalent in four southwestern counties: Allegheny, Fayette, Washington, and Westmoreland. A preliminary meeting held on July 27, 1791, at Redstone Old Fort in Fayette County, called for the selection of delegates to a more formal assembly, which convened in Pittsburgh in early September 1791. The Pittsburgh convention was dominated by moderates such as Hugh Henry Brackenridge, who hoped to prevent the outbreak of violence. The convention sent a petition for redress of grievances to the Pennsylvania Assembly and the U.S House of Representatives, both located in Philadelphia. As a result of this and other petitions, the excise law was modified in May 1792. Changes included a 1-cent reduction in the tax that was advocated by William Findley, a congressman from western Pennsylvania, but the new excise law was still unsatisfactory to many westerners. Appeals to nonviolent resistance were unsuccessful. On September 11, 1791, a recently appointed tax collector named Robert Johnson was tarred and feathered by a disguised gang in Washington County. A man sent by officials to serve court warrants to Johnson's attackers was whipped, tarred, and feathered. Because of these and other violent attacks, the tax went uncollected in 1791 and early 1792. The attackers modeled their actions on the protests of the American Revolution. Supporters of the excise argued there was a difference between taxation without representation in colonial America, and a tax laid by the elected representatives of the American people. Although older accounts of the Whiskey Rebellion portrayed it as being confined to western Pennsylvania, there was opposition to the whiskey tax in the western counties of every other state in Appalachia (Maryland, Virginia, North Carolina, South Carolina, and Georgia). The whiskey tax went uncollected throughout the frontier state of Kentucky, where no one could be convinced to enforce the law or prosecute evaders. In 1792, Hamilton advocated military action to suppress violent resistance in western North Carolina, but Attorney General Edmund Randolph argued there was insufficient evidence to legally justify such a reaction. In August 1792, a second convention was held in Pittsburgh to discuss resistance to the whiskey tax. This meeting was more radical than the first convention; moderates such as Brackenridge and Findley were not in attendance. One moderate who did attend—to his later regret—was Albert Gallatin, a future secretary of the treasury. A militant group known as the Mingo Creek Association dominated the convention and issued radical demands. As some of them had done in the American Revolution, they raised liberty poles, formed committees of correspondence, and took control of the local militia. They created an extralegal court and discouraged lawsuits for debt collection and foreclosures. Hamilton regarded the second Pittsburgh convention as a serious threat to the operation of the laws of the federal government. In September 1792, he sent Pennsylvania tax official George Clymer to western Pennsylvania to investigate. Clymer's clumsy attempt at traveling in disguise, and his efforts to intimidate local officials, only increased tensions. His somewhat exaggerated report would greatly influence the decisions made by the Washington administration. Washington and Hamilton viewed resistance to federal laws in Pennsylvania as particularly embarrassing, since the national capital was then located in the same state. On his own initiative, Hamilton drafted a presidential proclamation denouncing resistance to the excise laws and submitted it to Attorney General Randolph, who toned down some of the language. Washington signed the proclamation on September 15, 1792. It was published as a broadside and printed in many newspapers. The federal tax inspector for western Pennsylvania, General John Neville, was determined to enforce the excise law. Neville, a prominent politician and wealthy planter, was also a large-scale distiller. He had initially opposed the whiskey tax, but subsequently changed his mind, a reversal that angered some western Pennsylvanians. In August 1792, Neville rented a room in Pittsburgh for his tax office, but the landlord turned him out after being threatened with violence by the Mingo Creek Association. From this point on, tax collectors were not the only people targeted in Pennsylvania: those who cooperated with federal tax officials also faced harassment. Anonymous notes and newspaper articles signed by "Tom the Tinker" threatened those who complied with the whiskey tax. Those who failed to heed the warnings might have their barns burned or their stills destroyed. Resistance to the excise tax continued through 1793 in the frontier counties of Appalachia. Opposition remained especially strident in western Pennsylvania. In June, Neville was burned in effigy by a crowd of about 100 people in Washington County. On the night of November 22, 1793, men broke into the home of tax collector Benjamin Wells in Fayette County. Wells was, like Neville, one of the wealthier men in the region. At gunpoint, the intruders forced Wells to surrender his commission. President Washington offered a reward for the arrest of the assailants, to no avail. The timing of these events would later prove to be controversial. In his book on the insurrection, Findley—a bitter political foe of Hamilton—maintained that the treasury secretary had deliberately provoked the uprising by issuing the subpoenas just before the law was made less onerous. In 1963, historian Jacob Cooke, an editor of Hamilton's papers, regarded this charge as "preposterous", calling it a "" that overstated Hamilton's control of the federal government. In 1986, historian Thomas Slaughter argued that the outbreak of the insurrection at this moment was due to "a string of ironic coincidences", although "the question about motives must always remain". In 2006, William Hogeland argues Hamilton, Bradford, and Rawle intentionally pursued a course of action that would provoke "the kind of violence that would justify federal military suppression". According to Hogeland, Hamilton had been working towards this moment since the Newburgh Crisis in 1783, where he conceived of using military force to crush popular resistance to direct taxation, for the purpose of promoting national unity and enriching the creditor class at the expense of common taxpayers. The historian S. E. Morison believed Hamilton, in general, wished to enforce the excise law "more as a measure of social discipline than as a source of revenue..."
Federal Marshal Lenox delivered most of the writs without incident. On July 15, he was joined on his rounds by General Neville, who had offered to act as his guide in Allegheny County. That evening, warning shots were fired at the men at the Miller farm, about 10 mi (16 km) south of Pittsburgh. Neville returned home, while Lenox retreated to Pittsburgh. On July 16, at least 30 Mingo Creek militiamen surrounded Neville's fortified home, Bower Hill. They demanded the surrender of the federal marshal, whom they believed to be inside. Neville responded by firing a gunshot that mortally wounded Oliver Miller, one of the "rebels". The rebels opened fire, but were unable to dislodge Neville. The rebels retreated to nearby Couch's Fort to gather reinforcements. The next day, July 17, the rebels returned to Bower Hill. Their force had swelled to nearly 600 men, now commanded by Major James McFarlane, a veteran of the Revolutionary War. Neville had also received reinforcements: ten U.S. Army soldiers from Pittsburgh under the command of Major Abraham Kirkpatrick, a brother-in-law of Neville's wife. Before the rebel force arrived, Kirkpatrick had Neville leave the house and hide in a nearby ravine. David Lenox and General Neville's son, Presley Neville, also returned to the area, though they could not get into the house and were captured by the rebels. Following some fruitless negotiations, the women and children were allowed to leave the house, and then both sides began firing. After about an hour, McFarlane called a cease fire; according to some, a white flag had been waved in the house. As McFarlane stepped into the open, a shot rang out from the house, and he fell, mortally wounded. The enraged rebels then set fire to the house, and Kirkpatrick surrendered. The number of casualties at Bower Hill is unclear; McFarlane and one or two other militiamen were killed; one U.S. soldier may have died from wounds received in the fight. The rebels sent the U.S. soldiers away. Kirkpatrick, Lenox, and Presley Neville were kept as prisoners, but they later escaped. McFarlane was given a hero's funeral on July 18. His "murder", as the rebels saw it, further radicalized the countryside. Moderates such as Brackenridge were hard-pressed to restrain the populace. Radical leaders such as David Bradford emerged, urging violent resistance. On July 26, a group headed by Bradford robbed the U.S. mail as it left Pittsburgh, hoping to discover who in that town opposed them. Finding several letters that condemned the rebels, Bradford and his band called for a military assembly to meet at Braddock's Field, about 8 mi (13 km) east of Pittsburgh. On August 1, about 7,000 people gathered at Braddock's Field. This would prove to be the largest gathering of protesters. The crowd consisted primarily of poor people who owned no land. Most did not own whiskey stills. The furor over the whiskey excise had unleashed anger about other economic grievances. By this time, the victims of violence were often wealthy property owners who had no connection to the whiskey tax. Some of the most radical protesters wanted to march on Pittsburgh, which they called "Sodom", loot the homes of the wealthy, and then burn the town to the ground. Others wanted to attack Fort Fayette. There was praise for the French Revolution, and of bringing the guillotine to America. David Bradford, it was said, was comparing himself to Robespierre, a leader of the French Reign of Terror. At Braddock's Field, there was talk of declaring independence from the United States, and of joining with Spain or Great Britain. Radicals flew a specially designed flag that proclaimed their independence. The flag had six stripes, one for each county represented at the gathering: five Pennsylvania counties (Allegheny, Bedford, Fayette, Washington, and Westmoreland) and one Virginia county (Ohio County). Pittsburgh citizens helped defuse the threat by banishing three men whose intercepted letters had given offense to the rebels, and by sending a delegation to Braddock's Field that expressed support for the gathering. Brackenridge prevailed upon the crowd to limit the protest to a defiant march through the town. In Pittsburgh, only the barns of Major Kirkpatrick were torched. On August 14, a convention of delegates from the six counties was held at Parkison's Ferry, present-day Monongahela. The convention adopted resolutions, which were drafted by Brackenridge, Gallatin, David Bradford, and an eccentric preacher named Herman Husband, a delegate from Bedford County. Husband, a well-known local figure, was a radical champion of democracy who had taken part in the Regulator movement in North Carolina 25 years earlier. The Parkison's Ferry convention also appointed a committee to meet with the peace commissioners who had been sent west by President Washington. President Washington, confronted with what appeared to be an armed insurrection in western Pennsylvania, proceeded cautiously. Although determined to maintain government authority, he did not want to alienate public opinion. He asked his cabinet for written opinions about how to deal with the crisis. The cabinet recommended the use of force, except for Secretary of State Edmund Randolph, who urged reconciliation. Washington did both: he sent commissioners to meet with the rebels while raising a militia army. Washington privately doubted the commissioners could accomplish anything, and believed a military expedition would be needed to suppress further violence. For this reason, historians have sometimes charged that the peace commission was sent only for the sake of appearances, and that the use of force was never in doubt. Historians Stanley Elkins and Eric McKitrick argued that the military expedition was "itself a part of the reconciliation process", since a show of overwhelming force would make further violence less likely. In early August 1794, Washington dispatched three commissioners, all of them Pennsylvanians, to the west: Attorney General William Bradford, Justice Jasper Yeates of the Pennsylvania Supreme Court, and Senator James Ross. Beginning on August 21, the commissioners met with a committee of westerners that included Brackenridge and Gallatin. The government commissioners told the committee that it must unanimously agree to renounce violence and submit to U.S. laws, and that a popular referendum must be held to determine if the local people supported the decision. Those who agreed to these terms would be given amnesty from further prosecution. The committee, divided between radicals and moderates, narrowly passed a resolution agreeing to submit to the government's terms. The popular referendum, which was held on September 11, also produced mixed results. Some townships overwhelmingly supported submitting to U.S. law, but opposition to the government remained strong in areas where poor and landless people predominated. The final report of the commissioners recommended the use of the military to enforce the laws. The trend was towards submission, however, and westerners dispatched two representatives, William Findley and David Redick, to meet with Washington and to halt the progress of the oncoming army. Washington and Hamilton declined, arguing that violence would likely reemerge if the army turned back. Governor Henry Lee of Virginia commanded the federalized militia army. Liberty poles were raised in various places as the militia was recruited, worrying federal officials. A liberty pole was raised in Carlisle, Pennsylvania, on September 11, 1794. When the federalized militia arrived in that town later that month, suspected pole-raisers were rounded up. Two civilians were killed in these operations. On September 29, an unarmed boy was shot by an officer whose pistol accidentally fired. Two days later, a man was stabbed to death by a soldier while resisting arrest. President Washington ordered the arrest of the two soldiers and had them turned over to civilian authorities. A state judge determined the deaths had been accidental, and the soldiers were released. In October, 1794, Washington traveled west to review the progress of the military expedition. According to historian Joseph Ellis, this would be "the first and only time a sitting American president led troops in the field". Jonathan Forman, who led the Third Infantry Regiment of New Jersey troops against the Whiskey Rebellion, wrote about his encounter with Washington: "October 3d Marched early in the morning for Harrisburgh, where we arrived about 12 O'clock. About 1 O'Clock recd. information of the Presidents approach on which, I had the regiment paraded, timely for his reception, & considerably to my satisfaction. Being afterwards invited to his quarters he made enquiry into the circumstances of the man [an incident between a militia man and an old soldier mentioned earlier in the journal] & seemed satisfied with the information." Washington met with the western representatives in Bedford, Pennsylvania, on October 9 before going to Fort Cumberland in Maryland to review the southern wing of the army. Convinced the federalized militia would meet little resistance, he placed the army under the command of the governor of Virginia, Henry "Lighthorse Harry" Lee, a hero of the Revolutionary War. Washington returned to Philadelphia; Hamilton remained with the army as civilian adviser. The insurrection collapsed as the army marched into western Pennsylvania in October 1794. Some of the most prominent leaders of the insurrection, like David Bradford, fled westward to safety. After an investigation, federal government officials arrested about 20 people and brought them back to Philadelphia for trial. Eventually, a federal grand jury indicted 24 men for high treason. Most of the accused had eluded capture, so only ten men stood trial for treason in federal court. Of these, only Philip Vigol (later changed to Wigal) and John Mitchell were convicted. Vigol had beaten up a tax collector and burned his house; Mitchell was a simpleton who had been convinced by David Bradford to rob the U.S. mail. Both men were sentenced to death by hanging, but they were pardoned by President Washington. Pennsylvania state courts were more successful in prosecuting lawbreakers, securing numerous convictions for assault and rioting. The Washington administration's suppression of the Whiskey Rebellion met with widespread popular approval. The episode demonstrated the new national government had the willingness and ability to suppress violent resistance to its laws. It was therefore viewed by the Washington administration as a success, a view that has generally been endorsed by historians. The Washington administration and its supporters usually did not mention, however, that the whiskey excise remained difficult to collect, and that many westerners continued to refuse to pay the tax. The events contributed to the formation of political parties in the United States, a process already underway. The whiskey tax was repealed after Thomas Jefferson's Republican Party, which opposed the Federalist Party of Hamilton and Washington, came to power in 1801. The Rebellion raised the question of what kinds of protests were permissible under the new Constitution. Legal historian Christian G. Fritz argued, even after ratification of the Constitution, there was not yet a consensus about sovereignty in the United States. Federalists believed the government was sovereign because it had been established by the people, so radical protest actions, which were permissible during the American Revolution, were no longer legitimate. But the Whiskey Rebels and their defenders believed the Revolution had established the people as a "collective sovereign", and the people had the collective right to change or challenge the government through extraconstitutional means. Historian Steven Boyd argued that the suppression of the Whiskey Rebellion prompted anti-Federalist westerners to finally accept the Constitution, and to seek change by voting for Republicans rather than resisting the government. Federalists, for their part, came to accept that the people could play a greater role in governance. Although Federalists would attempt to restrict speech critical of the government with the Alien and Sedition Acts in 1798, after the Whiskey Rebellion, says Boyd, Federalists no longer challenged the freedom of assembly and the right to petition. Soon after the Whiskey Rebellion, actress-playwright Susanna Rowson wrote a stage musical about the insurrection entitled "The Volunteers", with music by composer Alexander Reinagle. The play is now lost, but the songs survive, and suggest that Rowson's interpretation was pro-Federalist. The musical celebrated the militiamen who put down the rebellion, the "volunteers" of the title, as American heroes. President Washington and Martha Washington attended a performance of the play in Philadelphia in January 1795. In L. Neil Smith's alternate history novel The Probability Broach (1980), Albert Gallatin convinces the militia not to put down the rebellion, but instead to march on the nation's capital, execute George Washington for treason, and replace the Constitution with a revised Articles of Confederation. As a result, the United States becomes a libertarian utopia called the North American Confederacy. In the satirical novel Joyleg, A Folly by Avram Davidson and Ward Moore, a veteran of both the American Revolutionary War and the Whiskey Rebellion is found alive and very well in the Tennessee backwoods, having survived over the centuries by daily soaks in whisky of his own making, to hilariously face the world of the 1960s. In 2012, Wigle Whiskey, the first distillery in Pittsburgh since Prohibition, was founded. It was named after Philip Wigle. From 1971 to 1993, the Hall of Presidents at Walt Disney World in Florida included a section on the Whiskey Rebellion. ↑ Robert W. Coakley, The Role of Federal Military Forces in Domestic Disorders, 1789–1878 (DIANE Publishing, 1996), 67. ↑ Chernow, 342–43; Hogeland, 63. ↑ Slaughter, 105; Hogeland, 64. ↑ Hogeland, 67; Holt, 30. ↑ Slaughter, 147–49; Hogeland, 68–70. ↑ Hogeland, 68–69; Holt, 30. ↑ Slaughter, 148; Hogeland, 69. ↑ Hogeland, 23–25; Slaughter, 113. ↑ Slaughter, 113. Hogeland dates the attack on Johnson to September 7, the night before the Pittsburgh convention; Hogeland, 24. ↑ 28.0 28.1 Mary K. Bonsteel Tachau, "A New Look at the Whiskey Rebellion", in Boyd, The Whiskey Rebellion: Past and Present Perspectives, 97–118. ↑ Slaughter, 119; Hogeland, 124. ↑ 39.0 39.1 Slaughter, 151. ↑ Slaughter, 177; Cooke, 328. ↑ Hogeland, passim. For an online summary of Hogeland's argument, see his "Why the Whiskey Rebellion Is Worth Recalling Now"; History News Network, July 3, 2006. Accessed June 22, 2010. ↑ S. E. Morison, "The Oxford History of the United States 1783-1917 (London: Oxford University Press, 1927), 182. ↑ The number of militiamen in the first attack on Bower Hill varies in contemporary accounts; Hogeland, 268. ↑ Slaughter, 179; Hogeland, 147–48. ↑ Slaughter, 179; Hogeland, 152. ↑ Hogeland, 153–54; Slaughter, 179–80. ↑ Slaughter, 186; Hogeland, 172. ↑ Slaughter, 188–89; Hogeland, 169. ↑ Holt, 10. Holt writes that earlier historians had misindentified the six counties represented by the flag. ↑ Slaughter, 187–88; Hogeland, 170–77. ↑ Elkins & McKitrick, 479. ↑ Slaughter, 199; Holt, 11. ↑ Elkins & McKitrick, 481. ↑ Mark G. Spencer, "Democratic-Republican Societies", in Peter Knight, ed., Conspiracy Theories in American History (Santa Barbara, CA: ABC-CLIO Press, 2003), 1:221. ↑ Slaughter, 192–93, 196; Elkins & McKitrick, 479. ↑ Slaughter, 199–200; Hogeland, 199. ↑ 83.0 83.1 Slaughter, 203. ↑ Chernow, 475–76; Hogeland, 189. ↑ Slaughter, 205–06; Hogeland, 213. ↑ Ellis, His Excellency, George Washington, 225. ↑ Manella, Angela. "Jonathan Forman Papers Finding Aid". Archive Service Center, University of Pittsburgh. http://digital.library.pitt.edu/cgi-bin/f/findaid/findaid-idx?c=ascead;cc=ascead;q1=jonathan%20forman;rgn=main;view=text;didno=US-PPiU-dar198201. Retrieved 4 April 2013. ↑ Forman, Jonathan. "Journal of Jonathan Forman, September 21, 1794 - October 25, 1794". http://digital.library.pitt.edu/u/ulsmanuscripts/pdf/31735051656100.pdf. Retrieved 4 April 2013. ↑ Richard A. Ifft, "Treason in the Early Republic: The Federal Courts, Popular Protest, and Federalism During the Whiskey Insurrection", in Boyd, The Whiskey Rebellion: Past and Present Perspectives, 172. ↑ Hogeland, 238; Ifft, 176. ↑ Elkins & McKitrick, 481–84. ↑ Boyd, "Popular Rights", 78. ↑ Slaughter, 221; Boyd, "Popular Rights", 80. ↑ Christian G. Fritz, American Sovereigns: the People and America's Constitutional Tradition Before the Civil War, ch. 6. ↑ Boyd, "Popular Rights", 80–83. ↑ Anita Vickers, The New Nation (Westport, Connecticut: Greenwood, 2002), 213. ↑ Susan Branson, These Fiery Frenchified Dames: Women and Political Culture in Early National Philadelphia (Philadelphia: University of Pennsylvania Press, 2001), 181. ↑ John J. Pierce, When world views collide: a study in imagination and evolution (Greenwood Press, 1989), 163. ↑ Peter Josef Mühlbauer, "Frontiers and dystopias: Libertarian ideology in science fiction", in Dieter Plehwe et al., eds., Neoliberal Hegemony: A Global Critique (Taylor & Francis, 2006), 162. ↑ 111.0 111.1 Toland, Bill (May 9, 2012). "Wigle Whiskey, Pittsburgh's first distillery since Prohibition, to open fsoon". http://www.post-gazette.com/stories/sectionfront/life/wigle-whiskey-pittsburghs-first-distillery-since-prohibition-to-open-soon-214217/?p=0. Holt, Wythe. "The Whiskey Rebellion of 1794: A Democratic Working-Class Insurrection". Paper presented at The Georgia Workshop in Early American History and Culture, 2004.